Not 100% happy with the item received? Please go to your order page and CONTACT US. We offer free replacement / full refund upon your demand. 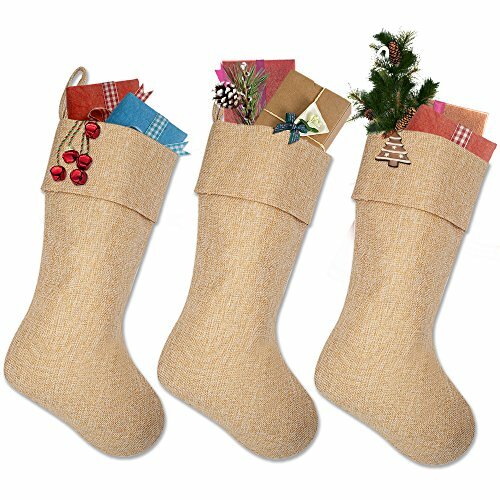 Plain burlap stockings ready to DIY. Wide cuff. You may embroider names on top. Made of 100% soft refined burlap. Double layer design. Thick, strong & durable. Roomy size, ready to be stuffed with goodies. 3" hang loop for easy display. Size: 18" tall, 19-1/2" diagonal at widest point. Top opening is 8-1/4" wide. Made of 100% fine burlap. Best stockings to give your christmas decorations a rustic touch. Plain color for DIY, create your personalized burlap stocking! Names can be embroidered on top. Double layer lining design. Thick & strong. Last for years. Comes in 3 pack! Ready to be stuffed with goodies gifts for whole family. Standard 18" size. Each stocking has a 3" ribbon hang loop for easy display. If you have any questions about this product by Ivenf, contact us by completing and submitting the form below. If you are looking for a specif part number, please include it with your message. Santa By The Fireplace Christmas House Flag Tree Stockings Toy Sack 28" X 40"
GiftsForYouNow Red Snowflake Christmas Stocking, 18.5"